The politicians faced each other, Bernard Ponsonby and an audience of 350 in Glasgow. 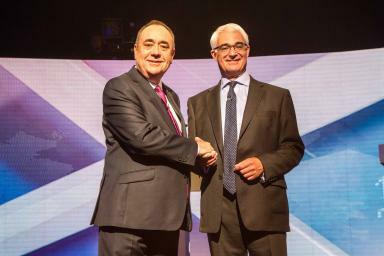 Alex Salmond and Alistair Darling have clashed in a landmark live television debate on STV. With just six weeks to go until the vote, the debate was the first time the two major figures in the independence referendum have come face-to-face on television to argue their case. STV’s political editor Bernard Ponsonby hosted the debate in front of an audience of 350 at the Royal Conservatoire of Scotland in Glasgow. Following the clash, an instant Guardian/ICM poll of viewers declared Mr Darling as the winner at 56% to 44%. The debate saw both men make opening statements and cross-examine each other before taking questions from the audience. With unprecedented demand for the live stream of the debate, you can catch up with each section of the debate here. The clash started with an opening statement from both men, with Alex Salmond setting out his vision for a fairer Scotland. He said: "Within 10 miles of where I'm standing in Glasgow there are 35 food banks, in this city and its surroundings serving thousands of families with children. "How is it in this prosperous country we have thousands of families with children dependent on food banks? He told the audience that for more than half of his life Scotland had been "governed by parties we didn't elect at Westminster." He added: "My case this evening is this: no one, no one will do a better job of running Scotland than the people who live and work in this country. "The question is not could we be an independent country, it is should we be an independent country?" "On September 18 we have the opportunity of a lifetime. We should seize that opportunity with both hands." In his opening statement Mr Darling said everyone in Scotland was proud of the country and wanted it to prosper but patriotism was not what was at stake. He said: "Rather it's something bigger than that, and that's the future of our country, the future for our children and our grandchildren. "And it isn't just for politicians, it's for all of us. There are times that for the love of our family and the love of our country it's sometimes best to say No, not because we can't, but simply because it's not the best thing to do. "In six weeks time we will make the biggest decision we've ever made here in Scotland and remember this, if we decide to leave there is no going back, there is no second chance. "For me the choice is very, very clear - I want to use the strength of the UK to make Scotland stronger. We can have the best of both worlds with a strong Scottish Parliament, with full powers over health, over education and with more powers guaranteed. "Because a vote to say No thanks to independence is not a vote for no change." When they got the chance to cross-examine each other, Mr Darling repeatedly asked Mr Salmond about the proposed currency union. Mr Darling said leaving the UK but keeping the pound was "a bit like getting a divorce and keeping the same joint bank account". He said: "If you leave the United Kingdom you leave the pound. What is your plan B if you don't get a currency union, this is most important." But the First Minister insisted: "We will keep the pound Alistair because it is our pound as well as England's pound. "It's logical and desirable to have a currency union because England is Scotland's biggest export market and Scotland is England's second biggest export market. "This is Scotland's pound, it doesn't belong to George Osborne, it doesn't belong to you, it's been built up by the people of Scotland over a long period of time." Mr Darling continued to press him, saying: "Contemplate for just one minute that you might be wrong. What is plan B? If you don't get a currency union what are we going to have instead? We need to know." Mr Salmond answered: "We will keep the pound because it belongs to Scotland much as much as it belongs to England. It's our pound as well as your pound." Mr Darling accused Mr Salmond of being "ridiculous" after a serious of questions from the First Minister on comments he claimed had been made by the No campaign. These included that Scots would have to drive on the right hand side of the road and would be more susceptible to attacks from outer space after independence. Mr Salmond asked whether Mr Darling agreed Scotland could be a successful independent country. Mr Darling replied: "I've always argued that the question isn't whether Scotland couldn't go it alone, the question is the cost we face in doing so. "My argument about Scotland is simply this, at the moment about 15% of Scotland's tax revenues come from North Sea oil. We know there are long-term declines, we know they are volatile." The audience's questions focused on currency, pensions, free higher education and economy. At the end of the clash, both politicians were given the chance to make a closing speech. 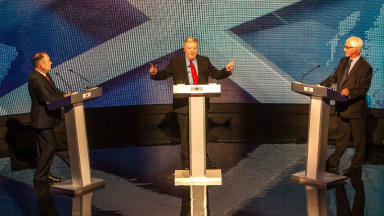 Mr Darling used it to saym uch of the debate had been "characterised by guesswork, blind faith and crossed fingers". "I want to tear down the barriers to increasing wealth and opportunities, I want to make sure that we live in a country that is as secure as possible. In his, Mr Salmond said there were "three big reasons" why Scotland should be independent. "Voting yes is a vote for ambition over fear. It tells the world that Scotland is an equal nation that carries itself with confidence and self-belief. "This is our moment - let's take it." The debate was extremely popular with viewers, attracting a higher online audience than the entire World Cup campaign and watched online by more than half a million people. Bobby Hain, STV's director of channels, said: "Tonight's event generated unprecedented levels of interest for the first head to head meeting of the campaign leaders."